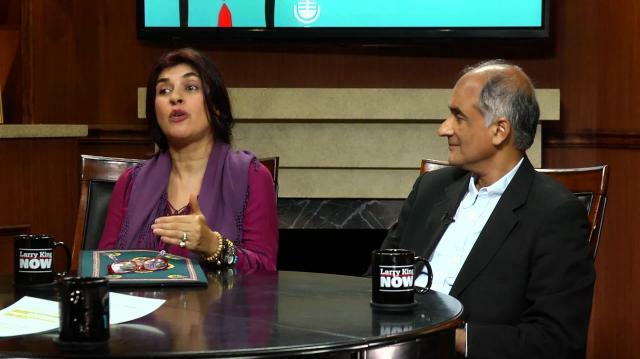 With news of terrorist attacks and divisive politics dominating most newscasts, Pico Iyer and Mitra Rahbar say partly disengaging from media is key to feeling less fearful in 2017. Larry King: How about fear? For example, you see a shooting everyday. Terrorism. How about living with fear of someone coming to harm us? Isn’t fear unhappiness? How do I overcome fear? Mitra Rahbar: I mean, fear definitely feeds on happiness. And fear is where there’s the absence of love and security and peace, and how do we overcome this, is the big question. Now, first I want to say Larry that we, the world is not new to the acts of violence, it’s just that we are nowmore aware of it because of the computer age. There has always been violence. There have always been acts of terror against people. But how do we overcome it and how do we not let our fear define us, is the key. And that’s where we go into, what I have to believe the positiveness of any circumstance, and see through that, how we can channel a good energy, a good light. Larry King: What part Pico, does the media play in this? Larry King: All news is generally bad until cancer is cured. Pico Iyer: If it leads it leads, precisely, yes. And I think one of the things with fear is it’s based on the unknown. What we think is going to happen an hour from now, we don’t know what’s going to happen, I could be fearful of somebody hitting me when I leave this room, somebody’s probably going to be very kind to me when I leave this room. So why don’t I concentrate on what’s happening right here, which isn’t fearful. I’m talking to two friends and having a good time.